Does your closet seem particularly hard to organize because it’s just so tiny? It’s true that small closets, especially oddly-shaped ones, as many smaller closets in older buildings are, can be difficult to deal with. But that doesn’t mean you can’t keep your little closet neat; you just have to avoid a few pitfalls that make it more difficult. Learn the most common mistakes people make when organizing a small closet, so you can avoid making the same ones. If you save every piece of clothing you have ever bought, and you have a small closet, it doesn't matter how organized you are in theory; in practice, your closet is going to drive you crazy. The first step to organizing any closet is to streamline its contents. With a small closet, you have even less space to work with, so it’s all the more important to weed out what you don’t wear. Using hangers in a variety of shapes, sizes and styles can ruin the most well-intentioned organizing plans. It sounds silly; why should it matter if hangers match? Well, they don’t have to match exactly (although it's preferable if they do), but they should at least be the same size and type. For example, you can hang pants from hangers with clasps or fold them over regular hangers. But if you do some one way and some the other, it becomes much harder to glance into the closet, see all your pants at once, and choose a pair. Additionally, large shirts draped over small hangers will wrinkle more easily, and hangers at varying heights can make it physically difficult to get your clothes out. When you’re trying to get dressed in the morning, the last thing you need is the annoyance of clothes catching on one another, falling to the closet floor or seemingly going missing. Therefore, go with a basic hanger with a bar so they work for pants, blouses and skirts. 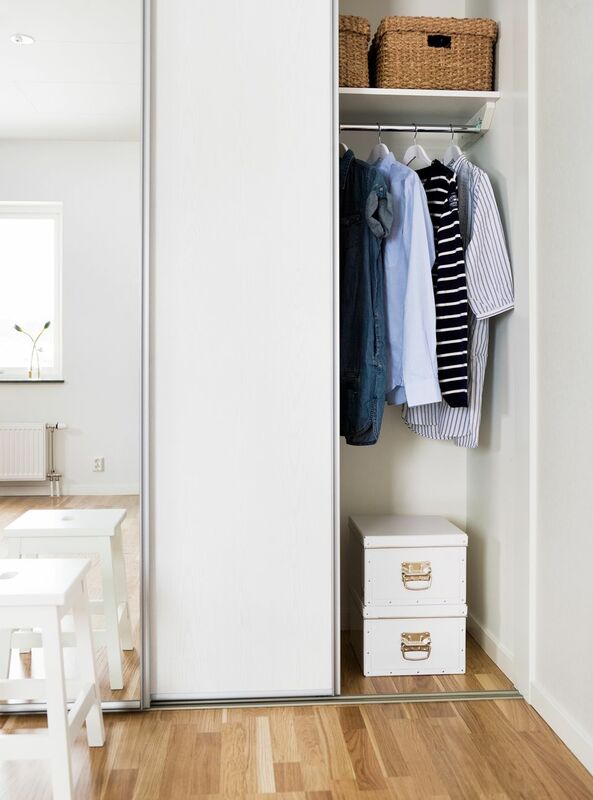 It’s hard enough organizing clothes well in a small closet, but if you have to deal with not only the clothes you wear on a daily basis but also the off-season clothes you won’t wear again for months, you’re going to start hating that little closet every time you have to open the door. If it’s possible, rotate your clothes according to the weather. Even some small closets have enough extra space to do this without resorting to the basement or attic. Try your closet floor or high shelf as an extra storage spot. Maybe you wouldn’t want to climb on a step-stool to reach your sweaters every day, but once or twice a year is fine if it gets them out of your way during the summer. Dividers, storage boxes and bins can be helpful in organizing your closet, but there’s a limit to their usefulness. They also take up space all on their own. If you depend on organizers to do your work for you, you’re going to be disappointed and have an unnecessarily cluttered closet. The only products you should introduce into a small closet are those that really save space. Large shelving units and racks will just get in your way. Instead, look for flat shelf dividers, small belt holders, and the like. When your closet is small, you might think you’ll be able to find any item easily even if they’re not categorized. How could you lose a pair of jeans in a closet 2 or 3 feet across? In fact, it’s pretty easy to do just that. And it can be even more of a struggle to find a given item when clothes are packed tightly into a little closet rather than hanging in a large walk-in. Sort clothes by type (jackets, shirts, dresses, etc.) and within those types, by color.